Since our last report was published in the previous edition (#7), it was now time to take delivery of our own new Voyager. It had been almost 9 months since we had decided to purchase the V1040, and I couldn’t help drawing a comparison with our wait to a long and anxious pregnancy. Finally, there she was in all her glory, sitting at the berth at Horizon Shores Marina waiting for us to go aboard for the first time. Ours had taken a little longer to build because we had a few customisations and extras fitted for our dream of cruising around Australia. Not that these boats need to have anything added to go cruising in safety and comfort, oh no, they have what it takes to go straight up to the Barrier Reef or down to Tassie right off the blocks, it’s just that we have been cruising up and down the coast for years and know what we want in a boat for our particular style of cruising. 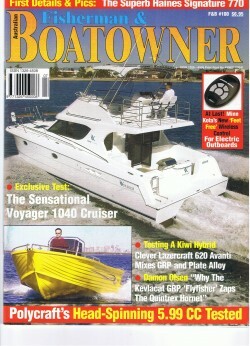 Introducing one of the most exciting new cruisers build in recent years in Australia. Forget all the awards, forget the hype and publicity surrounding the big players in the cruiser market, this cruiser has consigned them all to the history books. Last month we arranged to run the Voyager for the first of what we hope will be several trial, as we explore the potential and capability of this beautifully built, GRP power catamaran. 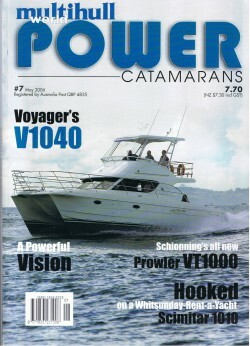 Queensland based Voyager Catamarans have raised the bar when it comes to advances in world Hybrid development for power boats. 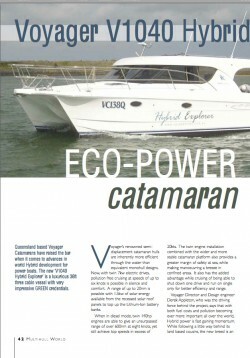 The new ‘V1040 Hybrid Explorer’ is a luxurious 36ft three cabin vessel with very impressive GREEN credentials.